by Healthy Little Secret.In Food, grocery shopping, healthy eating.Leave a Comment on Why Gluten Free? Why? Have you noticed the recent additions to your grocery store shelves? All over the store, little tags on different shelves and aisles calling to you. The marketing teams for grocery stores are good. They are able to capture the consumer’s attention. And what is the current marketing ploy? Gluten Free! Gluten Free is all the rage. Everywhere you turn you see labeling on everything from sauces, cookies, chips, pastas, drinks and frozen foods. And why not? Gluten Free is the current food diet trend, haven’t you heard? You have to strike while the iron is hot! So what’s the deal with Gluten Free? Why live a Gluten Free life? Originally it was primarily to support those with Celiac Disease. The treatment of symptoms and disease related complications. From there it sprung to Gluten Allergies. And if you were not allergic, then you were Gluten Sensitive. Now a days, Paleo, Atkins, Whole30 and other diets follow a Gluten Free based meal plan and hence the explosion of the Gluten Free product. Don’t get me wrong here. As someone who lives an 80/20 life, I stay away from gluten products. I understand that it causes inflammation and digestion issues. In addition, I don’t need all the extra calories from something that doesn’t support my nutrition and honestly doesn’t make me feel good at all. When I do have that piece of bread (typically French bread…love) my stomach bloats immediately and then afterwards I end up in a fog. That slice of warm French bread tastes delicious, and so I only partake 20% (or less) of my balanced healthful life. What does gluten actually do to the body? Why isn’t it good for you? There are many different reasons and explanations of course. But the simplest way to explain it is the inflammation that it causes to your entire body. Joints, muscles, organs even your skin. Inflammation is a way of the body telling you, This isn’t good for you and we’re fighting it off. Everyone reacts differently to gluten. We are not all designed the same, that’s the beauty of Mother Nature. But the simple fact is, if you’re bloated, feel lethargic and have no energy after you eat a slice of bread…it’s not good for you! Listen to your body. It will tell you when you’re eating things that are right or wrong for you and your health. Be mindful of that. Back to the where we started at the grocery store and all the Gluten Free products. Why am I a little peeved by all of this? Because I don’t use the term lightly! Living a Clean-Eating life means no processed foods, none. And as I walk down aisle after aisle at the store I see all these over processed foods with a sign in lights, Gluten Free, just calling for shoppers to stop and take a look. PROCESSED cookies, chips, pastas, drinks and sauces. Gluten Free does NOT mean that it’s good for you. It can be confusing to those who are trying to start a healthy lifestyle to hear things like Gluten Free and think it’s healthy. It’s really frustrating to me. I picked up a box of cookies with the tag Gluten Free and read the ingredients. First one was SUGAR. How is that healthy? My service announcement to you: Don’t be brainwashed. 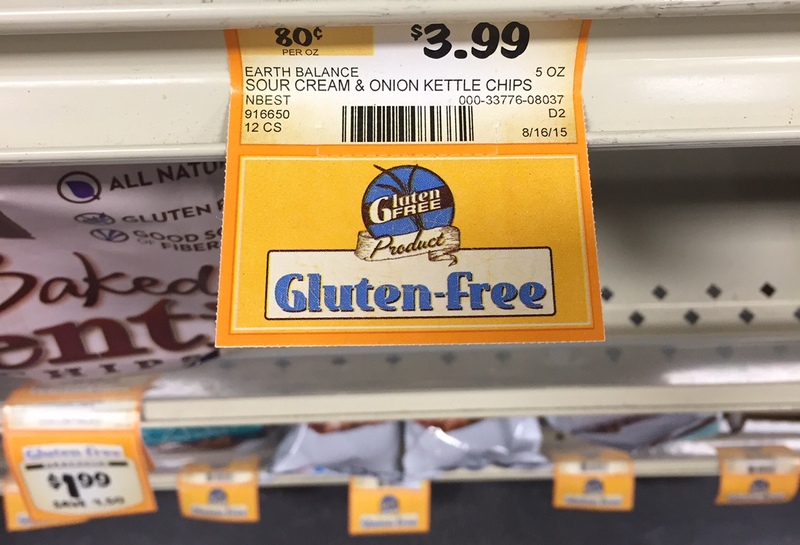 All Gluten Free products are not created equal.